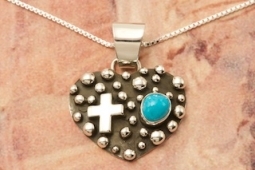 "Million Drops Collection" featuring a Sterling Silver Heart Pendant with a Sterling Silver Cross Design. Genuine Sleeping Beauty Turquoise Stone. Created by Santo Domingo Artist Raymond Coriz. Signed by the artist. Free 18" Sterling Silver Chain with purchase of pendant. Pendant is 1 3/8" L including the bale x 1" W.